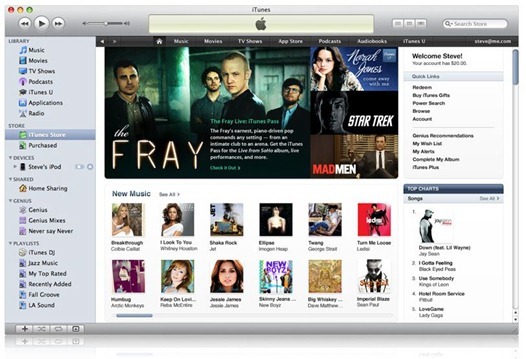 iTunes 9.1 to be Released on April 3 ?? Macrumors a trustworthy source of Apple news are reporting about iTunes 9.1 which is expected to release on April 3rd the day on which Apple iPad will be launched in US. Definitely this update is in order to support iPad. New features in iTunes 9.1 are changes to organization of book content in iTunes in order to support expected growth in eBook content driven by the iPad. Finally, iTunes 9.1 is claimed to offer several changes to device support, including tweaked summary panes (including a move of the “Check for Update” and “Restore” buttons to the left side of the pane) and the ability to automatically convert songs to 128 kbps AAC format when syncing to devices. This feature, currently available only for the iPod shuffle, will reportedly be extended to all devices and will allow users to fit more audio files on their devices while the original higher-quality files remain untouched in iTunes. One Response to iTunes 9.1 to be Released on April 3 ?? Previous Entry: Android 2.1 OTA Update for Motorola Milestone Owners in Europe?